Airports are finding creative ways to help passengers pass the time. 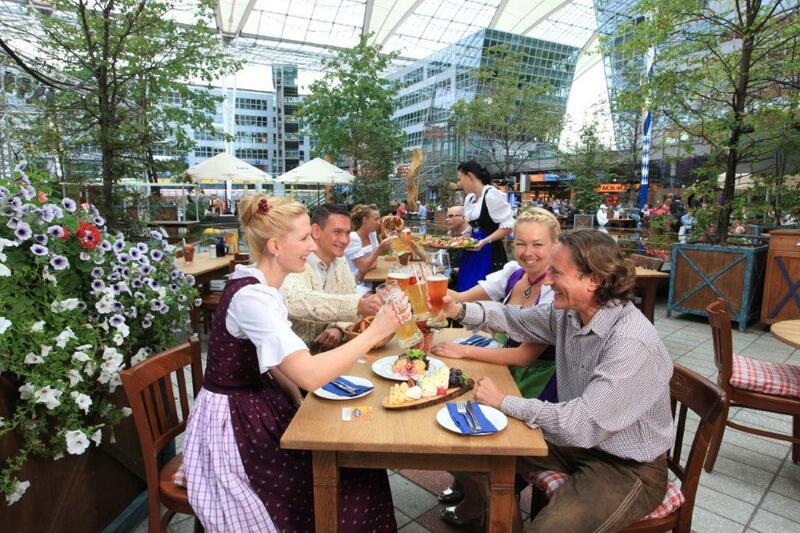 The beer garden in Germany, aptly named Airbrau, produces three kinds of beer. Art is the focus of attention for Paul and Elizabeth Cantor, as they stroll past a collection that could be on display at a major museum. Roger Hockman is equally focused as he fine tunes his putting on a compact practice green. There’s nothing unusual about these activities except where they’re taking place: They are helping passengers to pass time at airports in Munich, Denver and Palm Beach, Fla. The art scene at Denver International Airport includes works displayed outdoors, inside the terminal and even in tunnels through which trains pass carrying passengers to departure gates. 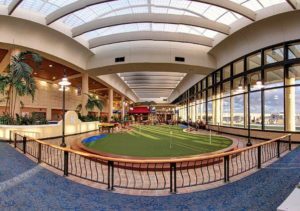 The putting green at the Palm Beach International Airport delighted Hockman when he had time to kill between flights. Antique Indianapolis 500 race cars are parked in that city’s airport. No surprise there. If you’ve ever seen a fluffy white dog carrying a toy duck in its mouth, a Scottish Terrier munching on a carrot or a pig playing a toy piano, you’ve probably been in the San Francisco International Airport. 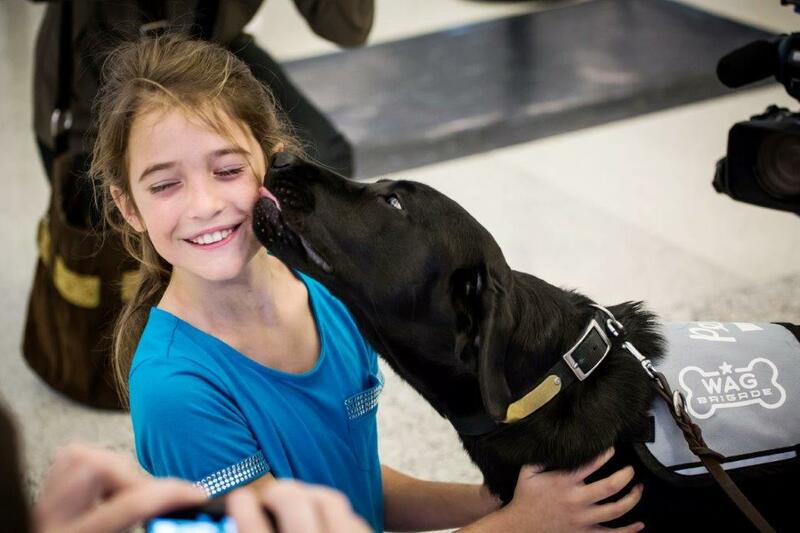 They’re members of the Wag Brigade, a group of trained dogs that roam the terminals pausing to do what they can to make passengers’ travel more enjoyable. The animals and their handlers are certified therapy teams. Wearing vests that say “Pet Me,” the canines — and a pig named LiLou — usually don’t have to walk far before someone pauses to make friends and watch the animals perform tricks. Even though Koi are nowhere near as huggable as dogs, kids at the Changi Airport in Singapore enjoy feeding those that live in a pond there. Youngsters learn a bit about the colorful and graceful fish that are particularly popular in Asia. The aptly named Kids’ Spots at San Francisco airport are designed to allow children to pick up knowledge while they use up excess energy prior to their flight. One area features interactive displays about weather while another is filled with art that also provides interactive learning experiences. The trend for airports to double as art galleries is being adopted around the world. Launched in 1977, the collection at San Francisco Airport contains more than 80 works that were chosen to reflect the area’s diverse culture. Art at other airports also depicts local cultures and other factors. In Vancouver, that means highlighting the landscapes and people of British Columbia. Passengers at the Portland, Maine, airport enjoy references to moose, deer and fish. Among displays at the Albuquerque International Sunport, which pay homage to the area’s setting and its Native American population, are wood carvings, pottery and works with names such as Hopi Woman and Buffalo Dancer. Mother Nature’s art also is on view at airports. At Changi, themed gardens provide respite from the hustle and bustle of travel. A Sunflower Garden occupies a flat rooftop, an Orchid Garden displays more than 700 plants and a Cactus Garden includes more than 100 species from around the world. Attractions at some airports appeal to the taste buds. Ethnic and local specialties are among dining choices available at O’Hare in Chicago, which has some 150 food establishments. During the annual Ticket to Taste event, chefs prepare meals, present cooking demonstrations and offer free samples. Passengers passing through Copenhagen Airport have a choice of “Nordic food.” The Beer Garden menu at Munich Airport includes Bavarian favorites such as pork sausage, roast pork in beer sauce and, for those with a sweet tooth, apple strudel. Eateries at Baltimore-Washington International Airport include an offshoot of the local favorite, O’Brycki’s, which touts “Crab cakes and more since 1944.” The restaurant lives up to that claim, offering crab soup, crab salad, crab cakes, crab melt — well you get the picture. Other amenities and services at airports include a barber shop and dry cleaner (Munich), yoga rooms (San Francisco), a Medal of Honor display (El Paso), aquariums (Vancouver), ice skating (Denver) and handicraft and baking activities (Zurich). Even passengers who forget to bring a book for their flight are in luck. They may borrow one at facilities in Seattle-Tacoma and Walla-Walla, Washington and Amsterdam’s Schipol, which initiated that service in 2010.